Informazione prodotto "Allen & Heath Xone 23"
The Allen & Heath Xone:23 is a 2+2 channel DJ mixer packed with pro features that would normally be found in the booth of a top-rated club, including an enhanced version of the legendary Xone filter with resonance control, VCA faders, 3 band total kill EQ, illuminated switches, crossfader curve selector and styling inspired by the flagship Xone:DB4. The 2 stereo channels feature independent level controls for each input enabling up to four stereo sources to be simultaneously routed to the mix, as well as the dedicated send and return system for external FX. The main mix output and mic input are on professional standard balanced XLR’s, and there is a dedicated record output. The Xone:23 is equipped with comprehensive monitoring facilities, including a booth output with its own volume control, a cue mix control, and signal levels clearly displayed on the 9 segment peak hold meters. 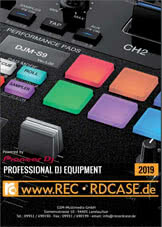 Recensioni clienti per "Allen & Heath Xone 23"
Ich hatte schon einige Mixer in Gebrauch. Dieser Mixer schlägt sie um viele Längen. Im Dauertest über 20 Betriebsstunden überzeugt der Xone 23 durchweg. Der Klang ist sehr gut und er verarbeitet die ihm zugeführten Signale einwandfrei. Auch möchte ich mich für die reibungslose und unkomplizierte Zusammenarbeit bei der Lieferung bedanken.